Blueberries! Our soil in this part of North Yorkshire is very, very alkaline. Blueberries are supposed to prefer acidic soil. 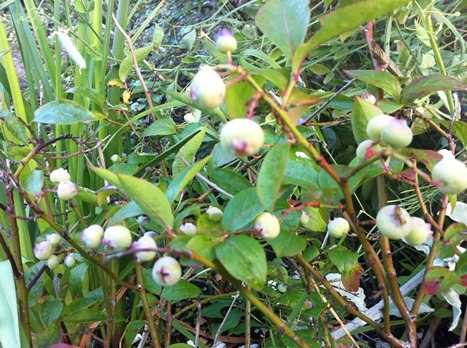 But our little blueberry bush, despite not growing very much, manages to put out a decent crop every year. I just have to get to the berries before the birds do. Blackberries! 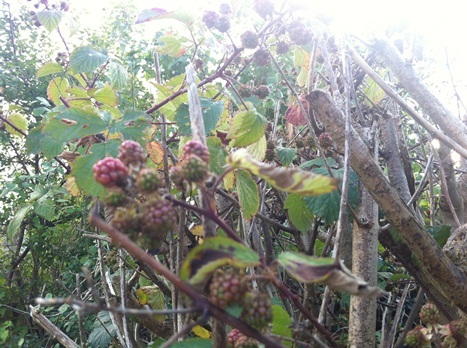 I’ve written about our brambles before. When we moved here, the lawn didn’t have any grass and was instead overrun with waist-high brambles. Brambles are tough buggers to get rid off, but we managed to uproot and cut ours back to the furthest corners of the garden. We still have to work to keep them in check, but they produce lots of delicious blackberries every year, so who am I to complain? As well as damson jam and damson cheese, I recall damson chutney, damson gin (mmmmm) and other damson liqueurs, damson bread, pork & damson sausages and burgers, and lots of different damson crumbles and damson puddings – including a fab crumble by the Cartmel Village Shop who do the famous sticky toffee pudding. I think the harsh winter is what has done the fruit trees the world of good. There is nothing better than a pot of home-made jam. Also crumbles and pies are another great treat. What about some home brew of some kind for your damsons? 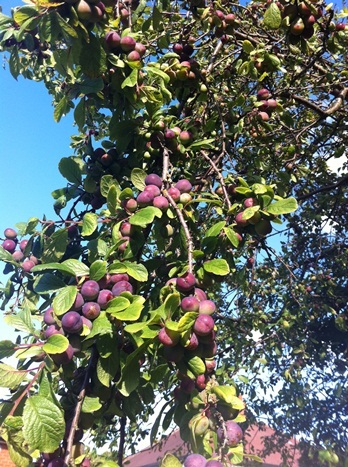 Try using some of those damsons to make Damson Gin. It tastes great. I sometimes see at for sale at Christmas Markets for £12 a bottle. I’m definitely a fan of the Damson Gin and Damson Vodka, but lots of other things to do with Damsons! Have fun! Never heard of a damson until now. I see now from helpful wikipedia that they’re another subspecies of plum. Sounds wonderful. I have to confess to not knowing what Damson’s are but they look a lot like plums. Maybe that’s what we call them in the U.S.? I’m in love with the rest of your crops? Do I see canning, jams, jellies, pudding and fruit pies in the future? Wish I was at your house…especially for the blueberries. I’m be all over a cheesecake with blueberry topping.